The post is brought to you by Seventh Generation. How many chemicals are you using in your home today? If that number is impossible to calculate—consider how many chemicals your family encountered this morning alone? Sadly, in most homes that number is still too large to easily grasp. At least those chemicals are nontoxic, right? Actually—many are not—and sadly, many consumers assume that they are being protected by governmental, environmental, health and safety regulations. This is why we have joined Seventh Generation in an effort to help them spread the word about their efforts to reform the outdated Toxic Substances Control Act. We think TSCA needs an upgrade—and we ask for your support in signing a petition to Fight Toxins. What is TSCA and why does it need updated? The Toxic Substances Control Act was passed in 1976 with good intentions. It was understood that while advances in the chemical industry had great potential—those advances also posed health and safety risks. TSCA was created to ensure the safety of chemicals from the point of manufacture, through use and to disposal. Unfortunately, the law was flawed from inception and has never been updated to correct its limitations or updated to meet scientific advancement. Weaknesses in TSCA have left the EPA largely unable to act on known health dangers or require testing on specific chemicals that may be unsafe. Other Environmental, Health and Safety Regulations do not adequately regulate exposures to most chemicals nor do they address the hazards a chemical may pose over its lifecycle. Of the 85,000 synthetic chemicals introduced into the market since the Toxic Substances Control Act was passed in 1976, the EPA has required testing on less than 10%. Scientists have linked exposure to toxic chemicals to many health risks, such as Cancer, Alzheimer’s, learning disabilities, asthma, birth defects, and various reproductive problems. Why am I concerned about toxins in commonly used products? As a former environmental engineering consultant, I spent a lot of time working with both manufacturers and regulators in areas of environmental health and safety risk analysis and compliance. I was pretty fortunate in that most of the companies for which I worked were very humane in not only meeting, but generally exceeding, the protections and limitations required by permitting and environmental, health and safety regulations. On the other hand, my experiences also taught me a lot about loopholes and flawed methods that less conscientious companies practice—and about the assumptions that so many consumers have about the health and safety of our environment, our workplaces and the even our homes, even with so many chemical exposures bombarding us every day. Personally, I try to limit most of my family's chemical exposures at home. My views on "safe chemical exposures" and toxicity limits are not what they once were. I no longer assume that a little exposure is safe. I think consumers have a right (and a responsibility) to know and understand every chemical and every risk in products. What does this mean—and what can you do to help improve the situation? As consumers, as parents, we shouldn’t feel safe and comfortable using untested chemicals—with potential health and safety risks-- around our families. Just as many of us now seek better labeling and disclosure in our food product ingredients—we should be seeking better information and health and safety protection in our other daily-use products as well. While some companies and manufacturers have willingly made shifts toward proven-safe ingredients and products—others simply must be pushed. Upgrading TSCA is a start in pushing industry toward more responsible (and safe) chemical usage, distribution and disposal. 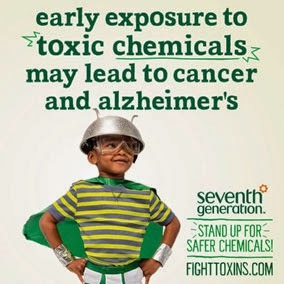 Please consider signing Seventh Generation’s Fight Toxins petition. Business and industry can change for the better—but, they will only do so when consumer demand forces it. Let industry know that you have a right to both know and understand the toxic risks associated with the products that you encounter each day! Disclosure: This post was sponsored by Seventh Generation in collaboration with Mom Bloggers for Social Good. All opinions in this post are my own--and I only participate in such campaigns when I have personal experience and support the project.